While looking for a book on the 1952 election, I stumbled across this one and it turned out to have a much narrower focus than I like when reading a book about an election. However, author William B. Pickett is definitely true to the words in the title. 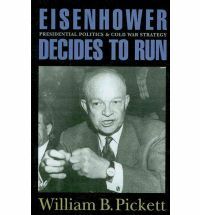 This book is solely about Dwight Eisenhower’s decision to run for President in 1952 against the backdrop of the Cold War. The general election of 1952 is never mentioned nor his Eisenhower’s Democratic opponent, Adlai Stevenson, ever turn up in the book. If you are particularly fascinated with the inner workings of how Eisenhower changed his stance from being a somewhat apolitical figure who worked as both President of Columbia University and Supreme Allied Commander of NATO in Europe, this is an ideal book. I found it a little bit too much detail about one particular decision. Eisenhower was floated as a candidate for President by the Democrats in 1948 because it was believed that Harry Truman was too unpopular to win reelection. Obviously, Truman was still somewhat popular. Pickett believes that Eisenhower wanted to run (while trying to look like he wasn’t running) because he feared that the Republicans would nominate Ohio Senator Robert Taft, who: 1) opposed the formation of NATO, 2) opposed U.S. involvement in postwar Europe, and 3) wanted to return the U.S. to a prewar isolationist foreign policy. Eisenhower did not want to see all that he worked for in Europe to go to waste. And he also felt that the Republicans were almost assured of being reelected. At one point, Truman tried to convince Eisenhower to run for President as a Democrat and he would run as Vice President. Eisenhower did not seem to think that would be a good idea. Although he was still a member of the Army, Eisenhower won the New Hampshire primary. And he started winning just about every other primary that did not have a favorite son candidate. However, coming to the convention in New York, the nomination was still in doubt between Eisenhower and Taft, who controlled a lot of delegates from state caucuses and party bosses. The Eisenhower forces, borrowing the organization that Thomas Dewey had put in place for 1944 and 1948, were able to outflank Taft’s people again. The first ballot was a deadlock, but before a second ballot could be called, Minnesota, as planned, changed its vote to Eisenhower, setting off several other states to change their votes and make Eisenhower an easy winner. The choice of California Senator Richard Nixon as running mate is not covered in the book, which means I don’t have to write about the Checkers speech. I am glad for that. 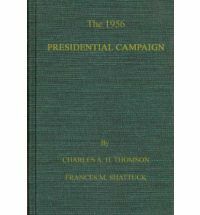 The Democrats are barely mentioned in the book, so, to fill you in on the process: Truman thought about running again, but fared poorly in New Hampshire and dropped out. Then everybody and his brother started running, but no one grabbed a lead. The Democrats waited until the third ballot to nominate Illinois Governor Adlai Stevenson for President. Senator John Sparkman of Alabama was named as his running mate. In the general election, the Republicans won big, winning 39 of 48 states for 442 electoral votes. Eisenhower and Nixon won 55% of the popular vote to Stevenson and Sparkman’s 44%. The Republicans also narrowly won control of both houses of Congress. Taft was able to return to the Senate as majority leader, although he would pass away from cancer in July of 1953.